This 18th century chest is veneered entirely with olivewood on an oak and pine ground. Aged olive is often wrongly described as walnut – their colour is similar, the grain however quite different. You can see from this picture how shrinkage of the drawer front has caused the veneer to lift away. 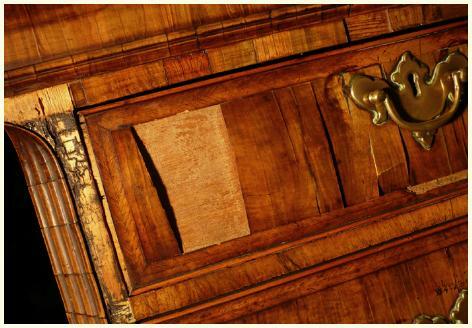 Many of the past repairs have been in walnut, we will replace these and carry out all the repairs using olivewood. The original cornice, waist and lower mouldings have all been worked in the traditional early 18th century manner by using an angled pine strip, onto which olivewood sections (with their grain at right angles to the strip), are glued side by side. The moulding is then worked in the olivewood, effectively a veneer. This is called short grain, a technique used to accentuate the pattern of the wood for a greater visual impact. As well as the work to the veneer and polishing, we have to repair the drawer runners, cut keys for the 18th century locks, repair the brass handles and replace where missing.